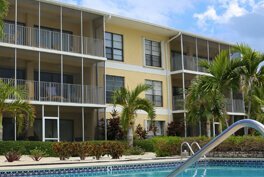 The Anchorage Condominium complex is a 15 unit property situated at the quiet end of Seven Mile Beach in the Cayman Islands, The Anchorage offers two and three bedroom, two bathroom Grand Cayman condos for rent, each with a spacious living room and dining room. Each unit is privately owned with its own personal touches. In addition, most of the two bedroom rentals have an additional den that is an optional third bedroom. Each of our Seven Mile beach vacation rentals have a fully equipped kitchen, central air conditioning, cable TV, telephone, ceiling fans, free High-speed WiFi internet access and a screened balcony/porch. Other shared features include a private beach area, freshwater swimming pool, private tennis court, washers/dryers, beach cabanas, beach umbrellas, and outdoor barbeque grills as well as WiFi internet access on the beach. Being one of the smaller complexes on the island gives plenty of beach access for all guests. 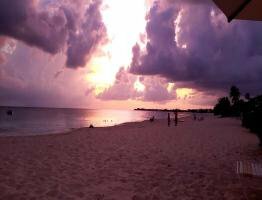 On the doorstep of The Anchorage is the breathtaking Cayman Island Seven Mile Beach - a glorious stretch of powdery sand sloping into the shallow water of the Caribbean Sea near West Bay. Venture beyond 7 Mile Beach and you'll find bustling Camana Bay & George Town shopping and markets. Just off shore is wonderful sandy bottom ocean to relax in the quiet Caribbean. 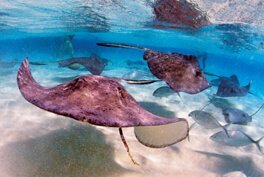 Within walking/swimming distance is Cemetery Reef, one of the many wonderful snorkeling spots of Grand Cayman. And within view is dive site, the Wreck of The USS Kittiwake, a popular dive site of Grand Cayman. 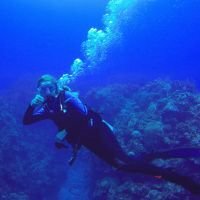 For active people looking for Grand Cayman excursions, there are watersports, underwater adventures, and many places to visit. The friendly on-premise staff is available to help plan your excursions.